Rest In Peace Detective Pitts. My sincere condolences to your family and to your department. God speed as you now patrol the streets of gold. Rest in peace my brother. 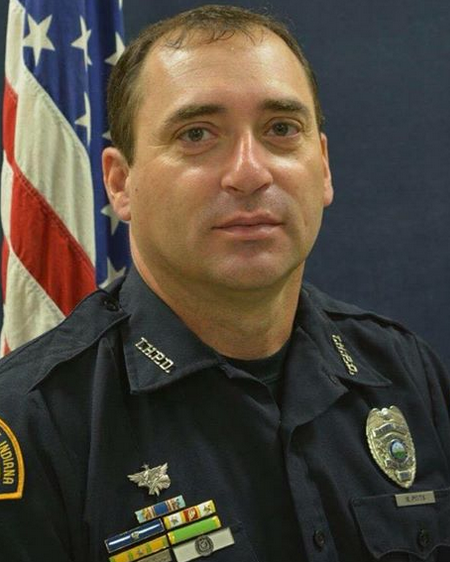 Our thoughts and prayers are with you, your family and the Terre Haute Police Department. May your family find peace. Thank you for your service brother keeping our state safe. Our thoughts and prayers are with each and every one of you during this difficult time. "Jesus Christ laid down his life for us. And we ought to lay down our lives for our brothers and sisters.” (I John 3:16). A great tragedy. We are deeply grieved at the loss of Officer Rob Pitts. Rest in peace Brother Rob, you are a true American Hero and will never be forgotten for your service and courage. Deepest condolences to Family, Department and Friends. Visit the web site ImagineHeaven.net for a glimpse of the Glorious Reunions awaiting. My Family Doctor, Heart Doctor and Pastor all feel many NDE visions are fully valid. All law enforcement men and women should indeed qualify as "Foxhole Christians" with their duty dangers. As Ray Comfort at LivingWater.com says "Passing is the doormat they wipe their feet on before entering Heaven.” It is our belief they will hear from the Lord Himself. “Do not fear. for it is your Father’s good pleasure to give you the Kingdom” (Luke 12:12). May God bless Officer Pitts, his family and colleagues. Rest easy. Rest in peace Officer Pitts! May God watch over your family, prayers for family and Department. Rest In Peace and Thank You Sir for your service. Thank-you for your service Police Officer Rob Pitts. I pray the Lord welcome you home and deliver blessings, comfort and peace to your family, friends and peers. God Bless Detective Pitts and his family during this time of need. Brother, I mourn your death at the hands of a nobody and I pray for you and those that know and love you best at this horrific time. Officer Pitts, you are a hero. God Bless you and may your eternal rest be ever PEACEFUL. Rest in peace brother. Thank you for your service. God's speed Detective. RIP Officer Pitts and thank you for your service. Rest in peace brother. We have the watch. Fair winds and following seas.